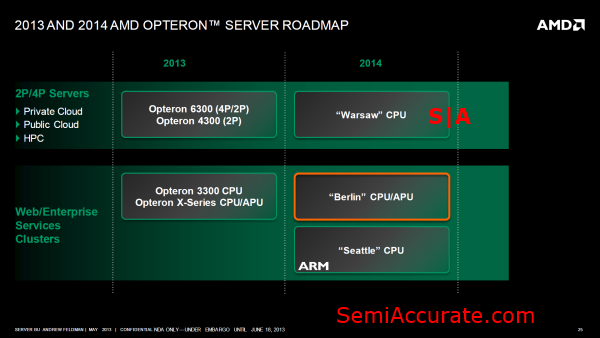 Today AMD is announcing its updated Server roadmap which contains three new products “Warsaw”, “Berlin”, and an ARM-based offering named “Seattle”. Outside of the recent launch of the Opteron X-Series, codenamed “Kyoto”, AMD hasn’t provided much if any guidance on its server roadmap to journalists over the past six months. But now AMD’s seen fit to come clean and show of its new roadmap which contains specifics on the ARM chip they announced in 2012, a refresh of the current “Piledriver”-based Opteron 6300 series, and a variant of AMD’s first HSA enabled APU, known on the desktop as “Kaveri”, that’s aimed at the midrange server market. Since the launch of the Opteron 6100 series back in early 2010 AMD’s server market share has consistently ebbed away. Gone are the days when AMD had the best 2P and 4P server processor on the market. A mild speed-bump in early 2011 failed to hold-the-line, and even the ill-fated Bulldozer core back at the end of 2011 failed to help AMD resist the pressure that Intel put on the company starting with Nehalem. At the end of 2012 AMD released the Opteron 6300 series which used an updated core called “Piledriver” that update was seen as more competitive but in the larger scheme of things failed to help AMD take any market share. Now a days AMD is said to supply chips for only about five percent of the server market. When I pressed AMD’s VP of Servers, Andrew Feldman, about AMD’s declining market share numbers he described it as a constant battle. But he was also hopeful that the products on AMD’s new roadmap would give the company the edge it needs to take market share back from Intel. With a complete refresh of AMD’s server product line-up to be completed by the end of H1 2014 and AMD’s first ARM-based product set to arrive in H2 2014 it’s not hard to imagine a scenario where AMD begins to retake market share. Of course this whole plan relies heavily on the companies’ ability to execute. AMD had a notable series of problems getting its “Llano” APU and its “Bulldozer” core to market in 2011. But recent efforts like the launch of the “Piledriver” core and the new “Richland” APU seem to have given OEMs more confidence in AMD’s ability to execute in accordance with its roadmap. Perhaps the most positive sign for AMD is the recent launch it’s “Kyoto”, “Kabini”, and “Temash” APUs which were the first implementation of the “Jaguar” core and AMD’s Graphics Core Next (GCN) architecture on the same die. All of this was done on the relatively new 28nm process at TSMC. If there was a place where problems with AMD’s internal structure would have shown up, it was with the launch of these new chips. Luckily for AMD those chips were on-time and offered exactly what the company specified on its roadmap. With this in mind it’s not hard to be optimistic about AMD’s ability to execute. Make no mistake though, the company still faces the pressures of a declining PC market coupled with the strain of making investments into the micro-server market and the ARM ecosystem which may or may not pay off for the company. But AMD’s current upswing has certainly buoyed confidence in the company. 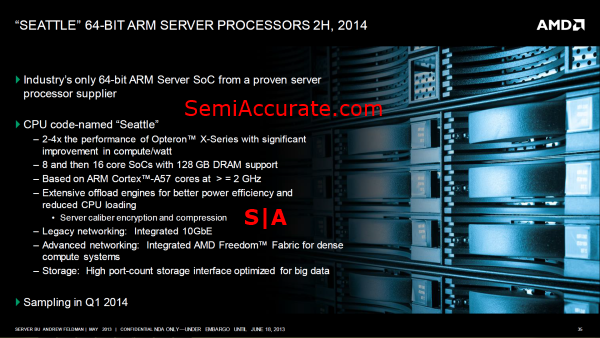 But by far the most important piece of IP on “Seattle” is AMD’s Freedom Fabric. Make whatever jokes you will about the name of this product and the relation of its target market to the ongoing NSA wiretapping scandal, but Freedom Fabric is a big deal. Much like how the success of AMD’s “Brazos” chip validated the company’s decision to purchase ATI Technologies in 2006 by bringing GPU cores onto the same die as the CPU for better power efficiency and reduced production costs; The success or failure of “Seattle” will be the final word on the wisdom of AMD’s SeaMicro acquisition at the end of 2011 and the big bet that AMD’s has placed on ARM’s first 64-bit server CPU core, the Cortex-A57. Moving back to the specifics of what AMD is promising with “Seattle”, the company expects the chip to deliver two to four times the performance of the current Opteron X-Series. Considering that the two major variants of the chip will be an eight and a sixteen core model, it seems that AMD is expecting performance to scale linearly with the increased core counts that “Seattle” offers over the merely quad-core X-Series chips. This bodes well for per core performance level of ARM’s Cortex-A57 chip which AMD apparently believes will match or exceed its “Jaguar” core when running micro-server workloads. AMD’s current Opteron X-Series chips are limited to 32 gigabytes per SoC, which is already quadruple what Intel’s S1200 series can muster. But AMD will be upping the ante again with “Seattle” by offering support for up to 128 gigabytes of memory per SoC. Additionally AMD is going to include specific IP blocks for doing encryption and compression which will no doubt be a big feature for the workloads that “Seattle” will be running. “Seattle” is also a fully HSA compliant chip according to AMD. No word on what that means exactly, especially considering that all signs point to “Seattle” being a CPU centric SoC; but an interesting point nonetheless. AMD’s “Seattle” SoC looks like a strong entry into the ARM-based server market which is currently dominated by companies like Calxeda and AMCC. Of course Nvidia has made it clear that it wants a piece of this market, and thanks to a few rumors in 2012 it would be unsurprising if Samsung jumped in as well. It’s hard to say how this market is going to develop but AMD’s certainly not showing up unARMed to the fight. Moving up one tier the product stack AMD’s renewing its assault on the 1P market by leveraging its mainstream APU rather than its high-end server part as it’s done traditionally. A server variant of “Kaveri” named “Berlin” will be targeting this segment, which means that AMD’s unreleased “Steamroller” core will make its first appearance in the server market inside of 1P servers. The 1P market is commonly associated with webhosting and workstations, unfortunately AMD’s “Berlin” won’t be able to compete with Intel’s workstation offerings which are based on the “Ivy Bridge-E” chip that Intel is rumored to release in the near future. But the cost-sensitive webhosting market may prove to be a better fit for “Berlin”. But there’s yet another market that maybe a good fit for “Berlin”, High Performance Computing. Most new supercomputer installations are based on a combination of High-end server CPUs and High-end discrete GPUs. Thus the combination of “Streamroller” CPU cores and GCN GPU cores, in tandem with full HSA compliance sounds like the recipe for a compelling HPC offering. There are some hurdles for “Berlin” to jump though, like the lack of 2P or 4P or 8P configurations and per chip performance deficit compared to a traditional CPU + GPU solution. But if AMD’s “Berlin” can offer higher performance per watt, an equivalent price, and an architecture that’s easier to code for than what’s currently available, it’s not hard to see “Berlin” having a major impact on HPC. It’s also worth noting that this isn’t the first time that we’ve seen an APU-based HPC installation as Sandia National Labs had a small installation of “Llano” based servers back in 2011 and Penguin Computing continues to sell the servers used for that project to this day. According to AMD the switch from a CPU only architecture to an APU design allows “Berlin” to produce 7.8 times the Gigaflops per watt of a current generation Opteron SE. AMD also expects “Berlin” to offer more than double the performance of “Kyoto” or the Opteron X-Series and 64 gigabytes of memory capacity. But by far the biggest single advantage that “Berlin” has in the server market is full HSA compliance which will allow for uniform memory access between the CPU and GPU portions of the chip and should make programming the chip both easier and more efficient compared to programming non-HSA APUs. The “Berlin” block diagram also tells us most of what we wanted to know about the still rather mysterious “Kaveri” including that the chip supports PCI-E 3.0. Although it still doesn’t shed any light on whether or not AMD will be offering variants of “Kaveri” with stacked DRAM as many have speculated. Overall “Berlin” is an interesting product for two major reasons; it’s the first mainstream server APU, and it’s the first server chip to fully implement the Heterogeneous System Architecture that AMD envisioned back in 2011 at their developer summit. 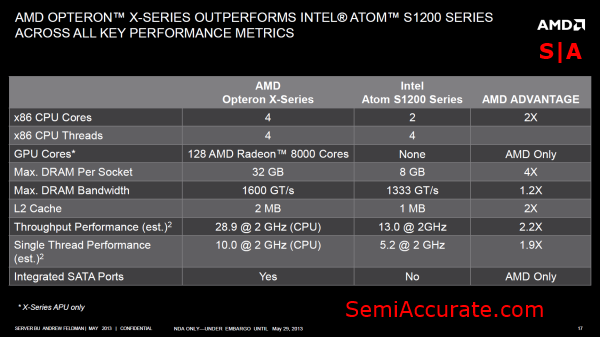 It’s hard to say how much those two points are worth though, especially considering that “Berlin” will probably offer less raw CPU performance than the outgoing Opteron 4300 series which has double the core count of AMD’s first HSA enabled server APU. At the same time though AMD doesn’t have much to lose by pushing APUs into the server market, and a lot of potential to exploit through HSA. The final product on AMD’s roadmap is “Warsaw” a twelve to sixteen core CPU, based off of AMD’s “Piledriver” core. It’s hard to have much hope for “Warsaw” as it’s a simple refresh of AMD’s current Opteron 6300 series chips which have been unable to stop AMD from bleeding server market share. “Warsaw” will be produced on Global Foundries 32nm process, offered in 2P and 4P configurations, and is compatible with AMD’s socket G34. In my chat with Mr. Feldman he seemed confident in AMD’s ability to make “Warsaw” a worthwhile refresh from AMD current “Abu Dubai” chips, by citing a focus on increasing efficiency. “Warsaw” will be similar to “Richland” in the sense that it takes advantage of process improvements to increase based clock speeds, and more aggressive power management to reduce consumption and offer higher TurboBoost clocks. The only really noteworthy trait of “Warsaw” is its integration into AMD’s version of the Open Compute Project’s server specification, called AMD Open 3.0. AMD’s been pushing Facebook’s Open Compute project as a way to reduce costs for large server buyers and seems to be having some success in that regard. Outside of that initiative though, “Warsaw” doesn’t have a whole lot to offer other than an easy upgrade path from AMD’s prior chips. 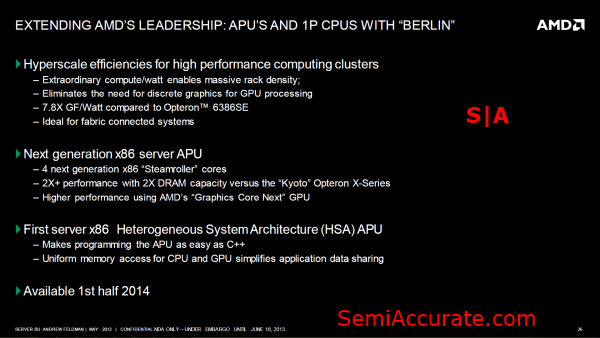 What’s more interesting though is what “Warsaw” says about AMD’s high-end server CPU development. 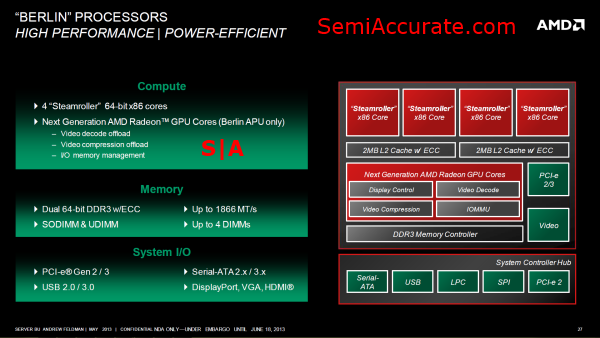 As late as AMD’s presentation at World Hosting Days in October of 2012 AMD had a rather nebulous “Future High Performance CPU” listed on its roadmap for introduction in H2 2014. But for whatever reason, that chip was canned. So despite “Steamroller’s” presence in the midrange, AMD’s high-end offerings will still be based on the aging “Piledriver” core. This news bodes poorly for enthusiasts who were hoping to see a “Steamroller” based FX CPU, because it’s doubtful that AMD would release an eight plus core chip without offering a server variant of said chip. If you were hoping to see AMD go head to head with Intel in the traditional 2P and 4P server market AMD’s current roadmap is probably a bit of a disappointment. But if you’re a large corporation looking at using micro-servers or if you have an application that maps well to GPU cores, than this roadmap update should be of great interest to you. If AMD’s ambidextrous strategy boils down to attacking niche markets where Intel’s flailing than it’s hard to say that the company isn’t executing on that vision. But if you were hoping that AMD’s engineers had figured out a way to take Intel head on than you’ll just have to keep waiting. Despite heavy competition and the use of a stock Cortex-A57 core AMD’s “Seattle” is shaping up to be a viable product in the ARM-based server market. “Berlin” has some interesting opportunities given its full HSA implementation and large GPU resources, and “Warsaw” is looking to leverage the Open Compute ecosystem to make gains for AMD. The company has a tough fight ahead of it to regain the market share that it’s lost to Intel over the past few years, but with the variety of tactics that AMD’s employing to work around Intel’s strongholds it hard to knock the company for not trying. The only flaw to AMD’s plan is its reliance on the “Piledriver” core at the high-end. That core didn’t fare well against Intel’s current crop of server chips, let alone the chips that Intel’s launching between now and the Q1 2014 release date set for “Warsaw”. Did you know that you can access all our past subscription only articles with a simple Student Membership for 100 USD per year? If you want in-depth analysis and exclusive exclusives than subscribe to the Professional level. We don’t make the news, we just report it. There is no guarantee when exclusives are added, but the Professional level is where you’ll find the deep dive analysis.